PONCA CITY, OK (Nov. 27, 2018) – The Bass Federation’s Student Angler Federation (SAF) announced today the 2019 High School Fishing schedule, including forty-two SAF High School Fishing State Championships, three SAF High School Fishing Challenge\Open tournaments, 15 Bass Pro shops FLW High School Fishing Opens, eight state high school athletic association sanctioned tournaments and the pinnacle event in all of high school fishing the High School Fishing World Finals and National Championship which has already been announced for 2019, 2020, 2021 and are listed as well. In 2018, across all SAF sanctioned events there were more than 30,000 participants in the SAF High School Fishing program. For 2019 just between TBF and FLW events they will have 67 tournaments in which to compete plus hundreds of other SAF sanctioned events. To that end SAF announced today that not only will the top 10% of each TBF and/or FLW State Championship Challenge or Open event earn a spot in the National Championship and ALL SAF members world-wide are eligible to compete in the High School Fishing World Finals just like in past years where TBF and FLW offered up over $150,000 in College scholarship and prizes in 2018. New advancement opportunities and details where announced for top High School anglers who win a SAF state championship and are 16 years old or older. 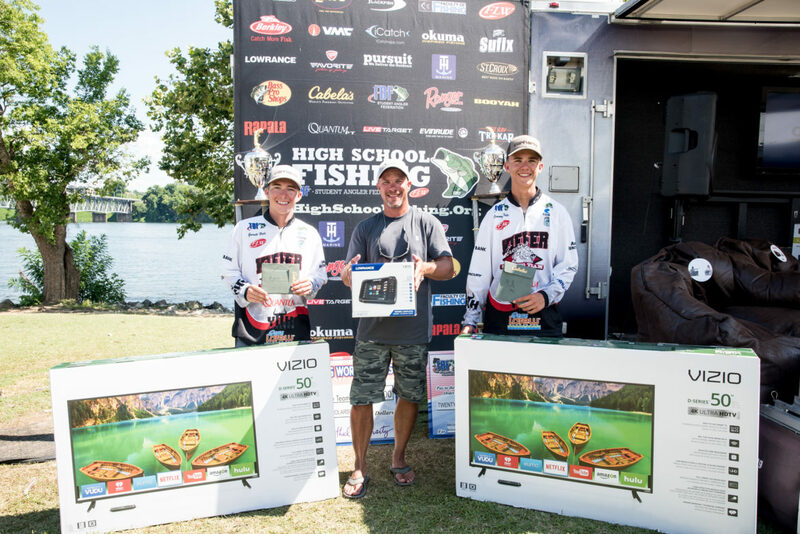 In 2019 the winners of ALL SAF State Championships who are 16 years old or older (one or both team members) will be offered a High School TBF Living The Dream package, a TBF sponsorship for a year to include: fully paid ADULT TBF\FLW competitor membership, Advancement opportunity to represent their home state in a TBF National Semi-Finals as a co-angler, with fully paid entry fees! From there, the sky is the limit, they could qualify for the TBF Federation National Championship, then to the BFL All-American or if they can earn a boater spot along the way possibly even the Forrest Wood CUP! All while fishing through their home state High School Championship and their home state TBF Federation, Additionally, FLW will place the winning team (16 years old or older) from the National Championship held in conjunction with the 2019 World Finals directly into the BFL All-American. June 18-22 Pickwick Lake Florence, Ala.
June\July TBA Upper Mississippi River LaCrosse, WI. June TBA Lake Hartwell Anderson, SC. Feb. 2 Florida State Championship – Harris Chain Tavares, FL. Feb. 2 Texas State Championship – LBJ Marble Falls, TX. Feb 16 South Carolina State Championship – Santee Cooper Summertown, SC. Feb 23 Alabama State Championship – Lay Lake Columbiana, AL. March 3 Georgia State Championship –Lake Lanier Gainesville, GA.
March 17 Missouri State Championship – Lake Of The Ozarks Osage Beach, MO. March 24 Louisiana State Championship – Toledo Bend Many, LA. March 30 Kentucky State Championship – Lake Cumberland Somerset, KY.
April 7 Illinois State Championship – Clinton Lake Weldon, IL. April 13 Arizona State Championship – Lake Havasu Lake Havasu City, AZ. May 4 Tennessee State Championship – Kentucky Lake Birdsong, TN. May 11 Arkansas State Championship – Lake Ouachita Hot Springs, AR. May 19 Washington State Championship – Moses Lake Moses Lake, WA. March 10 Lake Hartwell Early Bird Challenge Anderson, S.C.
August 25 Minnesota Challenge\Open – Lake Bemidji Bemidji, MN. Feb 9 Bass Pro Shops FLW Open – Lake Seminole Bainbridge, GA.
Feb 23 Bass Pro Shops FLW Open – Sam Rayburn Zavalla, TX. March 2 Bass Pro Shops FLW Open – Lake Guntersville Guntersville, AL. March 3 Bass Pro Shops FLW Open – Lake Mead Las Vegas, NV. April 6 Bass Pro Shops FLW Open – Lake Texoma Pottsboro, TX. April 13 Bass Pro Shops FLW Open – Lake Cumberland Burnside, KY.
April 27 Bass Pro Shops FLW Open – Smith Mountain Lake Huddleston, VA.
June1 Bass Pro Shops FLW Open – Chesapeake Bay Edgewood, MD. July 20 Bass Pro Shops FLW Open – Mississippi River Wabasha, MN. Sept 7 Bass Pro Shops FLW Open – Lake Erie Sandusky, OH. Sept.21 Bass Pro Shops FLW Open – Arkansas River North Little Rock, AR. Sept. 29 Bass Pro Shops FLW Open – California Delta Bethel Island, CA. Oct 19 Bass Pro Shops FLW Open – Lake of the Ozarks Osage Beach, MO. Nov 2 Bass Pro Shops FLW Open – Lake Hartwell Hartwell, GA.
May 18 IHSA Illinois State Championship – Carlyle Lake Carlyle, Ill.
April 27 KHSAA Reg 1 Regional Championship – Lake Barkley Kuttawa, Ky.
April 27 KHSAA Reg 2 Regional Championship – Lake Cumberland Somerset, Ky.
April 27 KHSAA Reg 3 Regional Championship – Green River Lake Campbellsville, Ky.
April 27 KHSAA Reg 4 Regional Championship – Cave Run Lake Morehead, Ky.
May 10-11 KHSAA Kentucky State Championship – Kentucky Lake Calvert City, Ky.
Additional SAF events are being added for the latest events line up, visit HighSchoolFishing.org. Registration for the 2019 season opens January 3rd, 2019. For SAF High School Fishing State Championships, each team must compete in the state in which their school is located. Teams from all states can compete in FLW High School Fishing Open tournaments and SAF High School Fishing Challenge events. Entries for State Championships and Challenge events should be made at HighSchoolFishing.org or by calling TBF at (580) 765-9031 and entries for Opens should be made at FLWFishing.com or by calling FLW at (270) 252-1000. There is no limit to the number of teams accepted into a tournament from each school or club. All FLW and TBF High School Fishing tournaments are free to enter. The tournaments are two-person (team) events for students in grades 7-12 and open to any SAF-affiliated high school club.